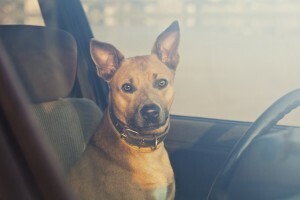 Many dog owners think that a few minutes in a hot car a dog are not a problem, but they pose a danger to life for a dog. The high temperature and humidity inside the car, it is no longer possible to gain cooling by panting. 105,8 °F body temperature leads to organ damage. If it rises to 109,4 °F, the body’s protein clots and it can be fatal. Should you find a heavily panting, apathetic, trembling or unconscious dog in a car, please inform the police immediately! After rescuing by the officials, the dog should be cooled with wet compresses on the legs and feet as well as temperate water. A visit to the vet is required due to fluid loss and clarification of late effects.